Contrary to what other review sites are not willing to disclose, SpaceMining.io is without question a Ponzi scheme. Promoting unrealistic returns such as 10% for a lifetime sounds like quite the bargain which is exactly what the creators behind this operation are hoping to allure through your deception. For those of you who have been possibly interested with making a generous investment with SpaceMining, we implore you not to commit until you have read our impartial review. SpaceMining.io is a cloud mining operation that focuses on the virtual mining of Bitcoin. Similar to most cloud mining operations, SpaceMining enables investors the ability to acquire hashing power in exchange for meeting a minimum deposit requirement. While no mention of which mining hardware or databases centers being used are disclosed, investors are left to trust only the components featured on the site. Which equates to believing the deceptive slogan of “Multiply your Bitcoins with us now,” that is featured across their homepage. Provided on the Contact Us page of SpaceMining.io would be two different contact forms. For those who are in need of more immediate assistance, they are encouraged to reach out to their email address of [email protected] or they can write to their corporate address of SpaceMining Ltd., 200 Aldersgate Street, London, EC1A 4HD, United Kingdom. According to a CompaniesHouse report, SpaceMining Ltd has been an active corporation since December 4th, 2017. The alleged director on file would be Lewis Wright, a British citizen born in December 1987. While a WHOIS domain search will verify that SpaceMining Ltd incorporation date is in accordance with the creation date of SpaceMining.io (December 3rd, 2017), it doesn’t go on to explain the questionable address on file. The provided address of 200 Aldersgate Street, London, EC1A 4HD, United Kingdom is a fictitious address that resides between a restaurant location and the Museum of London. Incorporating an incentive based investment and affiliate system, SpaceMining rewards investors who put more faith into their platform by incentivizing deposit and recruitment methods. 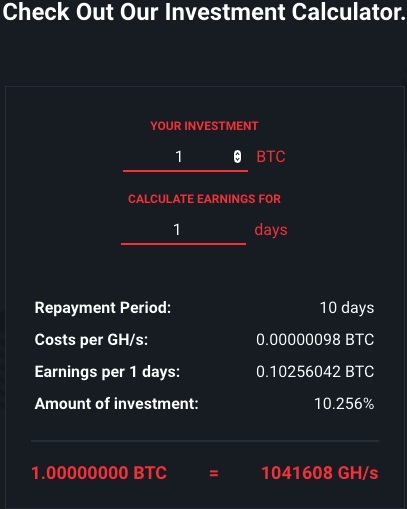 While the minimum deposit requirement is set at 0.0015 BTC, the more an investor deposits the higher daily return they will receive. These daily returns fluctuate between a value of 10% to 16% while the maximum deposit “accepted” is 15 bitcoins. Furthermore, as advertised many times of their site, all of their plans are lifetime. SpaceMining is structured almost identical to every other Ponzi scheme that we have encountered. Promising daily returns of 10% to 16% for the rest of your life is not only unrealistic but unsustainable in any business model. Just like most crypto scams we expose, SpaceMining provides no verifiable evidence let alone information regarding which mining hardware they employ or where their database centers are located. The promised returns are complete ludicrous and are only meant to lure and mislead investors out of their bitcoins. SpaceMining is a definite Ponzi scheme which means that it cannot be trusted. Furthermore, the discrepancies found in relation to their corporate entity is alarming and we have seen countless times how these illegitimate Bitcoin operations try to gain credibility by bragging about their UK based corporations when in reality it can be easily falsified. The lifetime daily returns are unachievable and there is no operational information disclosed on the site. SpaceMining.io must not receive many visitors because their site doesn’t rank of market intelligence sites like SimilarWeb. This could also be contributed to the fact that the domain was founded just over a month ago on December 3rd, 2017 but even new sites who draw in a respectful volume of traffic tend to rank on SimilarWeb. SpaceMining.io is a SCAM! There is no other way to say it, it will only be a matter of time until this operation becomes unsustainable and collapses upon itself. We have seen this countless times before which is why we are urging investors to avoid SpaceMining unless they so graciously wish to donate their bitcoins to an unworthy cause. To learn about legitimate and transparent mining opportunities, feel free to visit our Crypto Mining Guide. Review Verdict: SpaceMining is a Ponzi Scheme! Do you have any experience regarding SpaceMining? Please share your feedback, thoughts and story with us! For those of you seeking serious money making alternatives, make sure to visit our Cryptocurrency Investment Center.